Dirty PC Boards by David Johnson, P.E. sound. After that, I let my clients decide if they want to build additional units themselves or contract out the work with some local assembly house. The first 20 units I built worked flawlessly. So, why was he having so many problems now? The ice sensor was used by railroads, to activate electrical heaters in critical rail switching equipment whenever ice was detected. The drawing below illustrates how the system works. An accurate temperature sensor probe protruded from the top of a cup shaped cast aluminum sensor assembly. The temperature sensor determined if the air temperature was at or below freezing. Two stainless steel electrodes, insulated from the aluminum cup, were positioned inside the cup assembly. Under the cup was a heating element. When the temperature sensor detected a freezing temperature, the heating element would turn on. If ice formed on the cup assembly, the heater would melt it, allowing the now liquid water to tickle out grooves in the cup. The two stainless steel electrodes would then detect the water and activate the rail switching heaters. The idea was that if there was rain or snow and if the temperature was cold enough, then there was a good chance that ice was forming. I asked my client many questions. Did he do this? Did he do that? It seemed that all was right. I had no idea what could be wrong. I asked him to send me a couple of his units for additional testing. Since he said there were multiple symptoms, I could not imagine would could be causing all the different unrelated symptoms without conducting some tests. Since none of the units had passed his functional tests, the units he sent me had not yet been encapsulated in epoxy. When I received the units, I first tested their function. Just as my client had observed, the units were behaving very strangely. The heater would turn on well above freezing temperatures. The water detector would sometimes work but then not work. I carefully looked over the circuit board. At first glance all seemed to be correct. The right components were used. The wires leading to the heater and water sensors were properly soldered and nothing major caught my eye. I did see some solder flux residue but if my client used the type of solder I suggested, then that would not be a problem. For solder, I gave him two options. 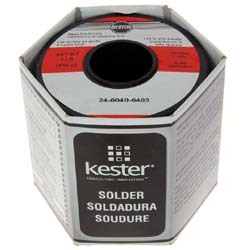 Since he was going to hand solder the boards himself, I suggested he could either use a tin-lead solder with a “no-clean” flux or a solder with a water-soluble flux. I told him that my first choice was the solder with water-soluble flux. I remember telling him how to clean the boards after the boards were complete. I suggested he scrub the boards with a dish type soap with tap water and then two rinse cycles using distilled water. A compressed air spray should be used to push off the excess water followed by a good 8 hours of drying time in open air. When I asked my client what solder he used, he said he thought he used the no-clean type. But, I thought I better check. I took the units he sent me and gave them a careful washing and drying. To speed up the drying process I used a hair dryer. After the boards were cleaned, I retested the units. Bingo! They all worked perfectly. 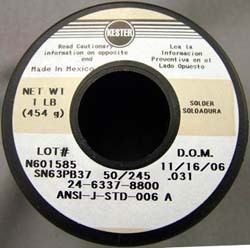 After I told my client the news, he called back later and said that he mixed up the two spools of solder. He thought he was using the no-clean spool when in fact, he was using the type that needed cleaning. He cleaned up all the boards he had soldered and reported to me that they all worked. He liked the way the water soluble flux solder worked, so he said he would continue using it but would add the cleaning and drying procedures to his little assembly line. After that, he no longer had any problems. Water soluble flux contains some materials which will conduct electricity. The materials will also absorb water from the air, making it even more conductive. 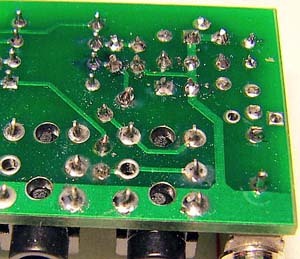 The leakage currents caused by the flux between the various components on the board produced all the strange symptoms.